We reprint below the report of South African socialist Patrick Bond, who attended the March 23-24 international conference of major climate-crisis groups and activists in Tunis. The conference, to be followed up by another in June in Europe, focused on what strategies and tactics to organize in anticipation of the 21st Conference of the Parties to the United Nations Framework Convention on Climate Change (COP21), set for Paris in November-December 2015. Bond takes note of the important political divisions that marked the Tunis proceedings, ranging from “reformist” perspectives that looked to capitalist governments and market-based solutions to those presenting a “radical” perspective that looks to “Seattle”-type actions that imply “closing down” the system. The Tunis conference took on a sense of urgency due to leaked reports that none of the world’s great polluters would be offering anything resembling real solutions to stop and reverse the present trend, in which a rise of two degrees centigrade in the global mean temperature would bring with it irreversible and catastrophic consequences for life on earth. In this context, it appears from Bond’s report that few, if any, perspectives were seriously considered that saw the independent, massive, and united actions of working people and their class allies organizing on a broad front to challenge capitalist prerogatives—that is, mobilizing the only mass forces that can effectively fight for “System Change, Not Climate Change.” Until such an independent class-based movement emerges to lead the climate struggle, the efforts based on reformist forces will achieve very little. See the pamphlet, “The Fight for Class and Climate Justice,” by Bill Onasch and Carl Sack, containing portions of the resolution approved by the 16th National Convention of Socialist Action. Order from Socialist Action, $2 plus $1 postage. 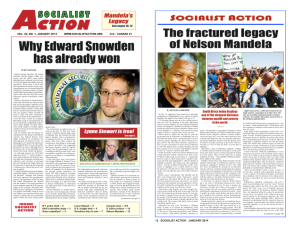 Patrick Bond will be a featured speaker at a panel discussion on South Africa, sponsored by Socialist Action Books, at this year’s Left Forum, to be held on the weekend of May 30-31 in New York City. TUNIS—Looming ahead in eight months’ time is another Conference of Polluters, or COP (technically, the Conference of the Parties to the United Nations Framework Convention on Climate Change). The last 20 did zilch to save us from climate catastrophe. Judging by early rough drafts of the Paris COP21 agreement recently leaked, another UN fiasco is inevitable. The Coalition Climat21 strategy meeting on March 23-24 began in Tunis just before the World Social Forum. I had a momentary sense this could be a breakthrough gathering, if indeed fusions were ripe now, to move local versions of “Blockadia”—i.e., hundreds of courageous physical resistances to CO2 and methane emissions sources—towards a genuine global political project. The diverse climate activists present seemed ready for progressive ideology, analysis, strategy, tactics, and alliances. Between 150 and 400 people jammed a university auditorium over the course of the two days, mixing French, English, and Arabic. It was far more promising than the last time people gathered for a European COP, in 2009 at Copenhagen, when the “Seal the Deal” narrative served to draw activist lemmings towards—and over—a cliff: first up the hill of raised expectations placed on UN negotiators, before crashing down into a despondency void lasting several years once leaders of the US, Brazil, South Africa, India, and China did a backroom deal that sabotaged a binding emissions follow-up to the Kyoto Protocol. In “Hopenhagen,” even phrases like “System change not climate change” were co-opted, as green capital educated by NGO allies agreed that a definition of “system” (e.g., from fossil fuels to nuclear) could be sufficiently malleable to meet their rhetorical needs. That precedent notwithstanding, the phrase “a climate movement across the movements” used here seemed to justify an urgent unity of diverse climate activists, along with heightened attempts to draw in those who should be using climate in their own specific sectoral work. Unity—without clarity, responsibility, and accountability? But this unity-seeking-minus-politics was reminiscent of a process four years ago in South Africa known as “C17,” a collection of 17 civil society organisations that did local preparatory work before the UN’s COP17 Durban climate summit. Actually, fewer than a half-dozen of the 17 representatives really pitched in throughout, and the moderate organisations which had promised to mobilise financial resources, media attention, and bodies ultimately did none of these. South Africa’s Big Green groups and trade unions failed to take C17 ownership, to commit resources and to add the institutional muscle needed. The Durban counter-summitmessaging was vapid and virtually no impact was made on the COP or on South Africa’s own reactionary emissions policy. The final rally of 10,000 activists midway through the COP17 unfortunately presented UN elites and local politicians with a legitimating platform. Nor did we use the event to build a South African climate justice movement worthy of the name. So my own assessment of the “state failure, market failure, and critic failure” in Durban strongly emphasised the problem of excessive unity, without ideological clarity, institutional responsibility or political accountability. Maybe it will be different in France, because their movements are mobilising impressively, with projects like Nov. 27-29 mass actions aimed at municipalities; a Brussels-Paris activist train; a “run for life” with 1000 people running 4km each from northern Sweden to Paris; the “Alternatiba” alternatives project with 200 participating villages from the Basque country to Brussels, which will culminate on Sept. 26-27; and getting warmed up, on May 30-31, an anticipated 1000 local climate initiatives around the country. Yet the local context sounds as difficult in 2015 as it was in South Africa in 2011. As Malika Peyraut from Friends of the Earth-France pointed out, national climate policy is “inconsistent and unambitious” and the country’s politics are poisoned by the rise of the far right to 25 percent support in municipal elections. French society will be distracted by regional elections from Dec. 6-12 and “there is a high risk of co-optation,” she warned. Indeed, there are no reliable state allies of climate justice at present, and there really are no high-profile progressives working within the COPs. It’s a huge problem for UN reformers because it leaves them without a policy jam-maker inside to accompany activist tree-shaking outside. Although once there were heroic delegates badgering the COP process, they are all gone now: Lumumba Di-Aping led the G77 countries at the Copenhagen COP15—where in a dramatic accusation aimed at the Global North, he named climate a coming holocaust requiring millions of coffins for Africa—and so was lauded outside and despised inside, but then was redeployed to constructing the new state of South Sudan; President Mohamed Nasheed from the Maldives—also a high-profile critic at Copenhagen—was outed by WikiLeaks for agreeing to a $50 million deal to get support for the Copenhagen Accord, was couped by rightwingers in 2012 and, earlier this month, was illegitimately jailed for a dozen years. Bolivia’s UN Ambassador Pablo Solon was booted from his country’s delegation after the 2010 Cancun COP16, where, solo, he had bravely tried to block the awful deal there; an Amazon jungle road-building controversy divided Evo Morales’ supporters, and in 2013 the COP’s progressive leadership void grew wide after the death of Hugo Chavez and the battle by Rafael Correa against green-indigenous-feminist critics for his decision that year to drill for oil in the Yasuni Amazon (after having once proposed an innovative climate debt downpayment to avoid its extraction); and Filippino Climate Commissioner Yeb Saño had a dramatic 2013 role in Warsaw condemning COP19 inaction after his hometown was demolished by Super Typhoon Haiyan, but he was evicted by a more conservative environment ministry (apparently under Washington’s thumb) just before the Lima COP in 2014. Yet with no real prospects of reform, the more militant activists were dissatisfied. Nnimmo Bassey from Oilwatch International was adamant, “We need not merely a just transition, but an immediate transition: keep the oil in the soil, the coal in the hole, the tar sands in the land and the fracking shale gas under the grass.” That, after all, is what grassroots activists are mobilising for. Added Nicola Bullard: “This narrative is too optimistic especially in terms of what will surely be seen as a failed COP21.” Bullard was a core Focus on the Global South activist in the 2007 Bali COP13 when Climate Justice Now! was formed. The movement’s principles were further fleshed out at the April 2010 World People’s Conference on Climate Change and the Rights of Mother Earth in Bolivia, to include emissions cut targets—45 percent below 1990 levels in the advanced capitalist economies by 2020—plus a climate tribunal and the decommissioning of destructive carbon markets which have proven incapable of fair, rational, and non-corrupt trading. Dating to well before the CJN! split from CAN in Bali, that latter fantasy—letting bankers determine the fate of the planet by privatising the air—remains one of the main dividing lines between the two ideologies of climate justice and climate action. Concrete actions against the emitters themselves were suggested, including more projects like the Dutch “Climate Games,” which saw a coal line and port supply chain disrupted last year. There are coming protests over coal in Germany’s Rhineland, and we will likely see direct actions at Paris events such as Solution 21, a corporate “false solutions” event where geo-engineering, Carbon Capture and Storage, and carbon trading will be promoted. Most important, she reminded, “There is Global North historical responsibility, and those who are most vulnerable have done the least to cause the problem.” This is vital because in Durban, UN delegates began the process of ending the “common but differentiated responsibility” clause. As a result, finding ways to ensure climate “loss & damage” invoices are both issued and paid is more difficult. The UN’s Green Climate Fund is a decisive write-off in that respect; a different approach to climate debt is needed. Back in 2009, just weeks before he died, this was what Dennis Brutus—the mentor of so many South African and international progressives—also advised: “Seattle Copenhagen!” The Paris Conference of Polluters also needs that kind of shock doctrine, so that from an activist cyclone a much clearer path can emerge towards climate justice in the months and years ahead.